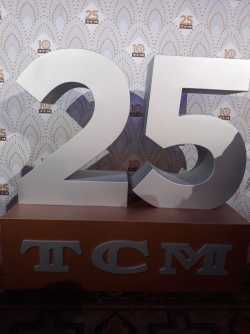 In celebration of the 25th anniversary, TCM is kicking off their first TCM25 Campaign encouraging everyone to share their favorite film from the year they were born on social using #TCM25. TCM will post the question (What’s your favorite film from the year you were born?) across their platforms at approximately 6pm ET on April 14. Have fun thinking about your pick and keep an eye out for the post on the 14th of April. And remember, use #TCM25 when you participate. We look forward to seeing your pick. Thank you! Exactly 25 years ago on April 14 at 6 p.m. ET, Turner Classic Movies was launched at a ceremony in New York City’s Times Square district by media maverick Ted Turner. A true estimate of the network’s devotion to film preservation and history, the date and time of TCM’s launch was chosen for historical significance as the exact centennial anniversary of the first public movie showing in New York City. The first movie broadcast on TCM was Gone With the Wind (1939) -David O. Selznick’s landmark epic about the Old South in the era of the American Civil War, starring Clark Gable, Vivien Leigh, Hattie McDaniel, Olivia de Havilland and Barbara O’Neil. Presented uncut and commercial free, TCM laid claim to presenting their films as such and still upholds that legacy today and is the only movie-based basic cable channel to do so. To celebrate its Silver Anniversary, TCM is once again screening it’s first ever programming line-up, featuring the original intro from TCM host Robert Osborne. The night will kick off with Gone With the Wind, a co-production of Selznick International and MGM, along with such other cinematic treasures as Columbia Pictures’ It Happened One Night (1934), starring Claudette Colbert and Gable; Warner Bros.’ The Petrified Forest (1936), starring Humphrey Bogart, Bette Davis and Leslie Howard; and RKO Pictures’ Cat People (1942), starring Simone Simon, directed by Jacques Tourneur and produced by Val Lewton.